The familiar gobble of a turkey may be heard a mile distant on a quiet still day. Male turkeys gobble while the females make a clicking sound. The Turkey is indigenous to the Americas. The Native American name for turkey is 'firkee', from this the turkey may have got his name. Some claim that Christopher Columbus named the turkey "tuka," the Tamil word for peacock. Here we have to remember that at the time Columbus thought he was in India and not in the New World, considering this, this definition seems more plausible. It has also been suggested that a physician who served under Columbus, Luis de Torres, named the bird "tukki," a Hebrew word for big bird. Benjamin Franklin called the Turkey "a bird of courage" he thought the turkey truly deserved to be the national symbol of America instead of the Bald Engle, whom he felt was "a coward". A baby Turkey is called a Poult, a fryer is the name given to a turkey under sixteen weeks of age, while a turkey five to seven months old is called a young rooster and a turkey 15 months or older is termed mature. A group of Turkeys is called a rafter rather than a flock or a gobble as most people incorrectly refer to them. Turkey senses. Auditory: Turkeys have no external ears but a keen sense of hearing nonetheless. Visual: At about 270 degrees turkeys have a wide field of vision and can see movement almost a hundred yards away. Olfactory: Turkeys have poor sense of smell. Gustation: Turkeys have an excellent sense of taste. Did you know that a turkey has a wingspan of nearly six feet. In the open forests in which they live they are by far the largest bird. The usual lifespan of a turkey is 10 years. Turkeys were domesticated by the Aztecs long before they were introduced into Europe by the Spaniards. The King of Spain was so impressed by the new bird that he ordered every ship returning from the New World to bring along 10 turkeys in addition to the gold and silver that they looted. The popularity of the turkey soon spread throughout Europe replacing the peacock at banquets. There are two species of turkeys, the wild turkey (Meleagris gallopavo) from Mexico and the US, and the ocellated turkey (Meleagris ocellata or Agriocharis ocellata) originally from Yucatan and Guatemala, the later may have been domesticated by the Mayans. The modern domesticated turkey is a descendant of the wild turkey. Wattle:The fleshy growth under a turkey’s throat. Snood: the long red fleshy part that grows from the forehead over the bill. Caruncle: the red-pink fleshy growth on the head and upper neck of the turkey which turns red during courtship or when the bird is angry. Feathers: A mature turkey has about 3,500 feathers. The heaviest male wild turkey recorded weighed 38 lbs. Contrary to popular belief turkeys can fly, at least wild turkeys, their domestic counterparts are now not able to do so due to selective breeding. Wild turkeys are capable of flying at speeds of up to 55 miles per hour for short distances and can travel on the ground at speeds of 25 miles per hour. In the wild turkeys sleep in trees, furthermore they prefer oak. In the wild male turkeys fight for dominance to win the right to mate with several females. Wild turkeys unlike their factory farmed counterparts have dark feathers which provide excellent camouflage in their natural woodland habitats. The bare skin on the throat and head of Turkeys, which is usually grey, changes colour to brilliant shades of red when he is excited or distressed. Wild Turkeys forage for food such as acorns, seeds, roots, insects and wild berries. Male turkeys are called Toms or Gobblers. This is perhaps due to the gobble gobble sound which they make along with grunts whilst strutting about shaking their feathers trying to attract females for mating. Like female chickens, female turkeys are called hens. The wild turkey the early Europeans and colonists encountered was not the bird that dominates 20th-century hunters' talk. In anecdote after anecdote from the 17th through the 19th centuries, the wild turkey was characterized as showing an almost Disneylike friendliness towards people. Wild turkeys, as the first settlers found them, walked right up to them. Sadly, the birds were likely to be met with a bang for their bravery. Here are some examples of early encounters between Man and the Bird as told by the settlers. "Wild turkeys drinking at the river were so undisturbed by a nearby hunter that he took away their broods of chicks without difficulty." "They came so close to people they could be shot with a pistol." "They hovered close to our fire so we killed them all." "Wild turkeys would come to our house and roost in the trees with the chickens. They often sat with their young on my fences so trustingly that I found it difficult to bring myself to shoot them." The "turkey trot" is a dance so named because of the short jerky steps which resemble that of a turkey. Turkeys in religion and mythology. The Aztecs not only used turkeys as a source of food, meat and eggs and the feathers extensively as decoration, but the turkey was also of religious significance. The turkey was considered one of the manifestations of their trickster god, Tezcatlipoca, a god who was elevated to the highest position in the Aztec pantheon. The Aztecs dedicated two religious festivals a year to the "huexolotlin," the Aztec name for turkey. Turkey eggshells which had been saved during the months between ceromonies were strewn upon the streets to honour the god who supplied them with a plentiful scource of food. The Mayans used turkey parts in sacred ceremonies for healing, planting and praying for rain. In the tradition of Native Americans the turkey is associated with spirituality and the honouring of Earth mother. It was believed that shamans were able to turn themselves into turkeys and were thus able to prowl around other villages unrecognised. In the tradition of the Hopi creation myths, a male turkey was the first bird to try to raise the sun in the sky. The turkey is a totem animal and is called the "give away eagle" or "life giver" and is associated with shared blessings such as harvest and fertility. ​The Turkey unfortunately has become part of the Christian tradition of roasting and cooking a bird to celebrate the birth of its founder Jesus whom followers of Christianity believe to be the son of God and the "Prince of peace". Previously here in the UK a goose or boar was eaten until the introduction of turkeys in the 16th century. Ten million Turkeys are slaughtered in the UK alone each Christmas, please refer to Factory Farming:Turkeys if you have not already done so. In addition to Christmas the Turkey, again roasted, is also a part of the festivities to mark Thanksgiving Day in the USA. Thanksgiving was originally a Christian celebration to give thanks to God and its origins may trace back to harvest festivals celebrated by many cultures, and also to commemorate the deliverance of the English settlers by Native Americans after the harsh winter at Plymouth, Massachusetts, but today it is now primarily a secular holiday. Rather like Christmas people stay home to celebrate with family and friends and also like Christmas this celebration includes a feast, usually a roasted turkey. Why a turkey? Traditionally a goose was roasted in England to celebrate harvest time, as the wild turkey was more abundant than geese eventually the turkey became the chosen celebratory meal. Painted in 1876 the painting below was planned as a decorative panel, rendered in oil on canvas. 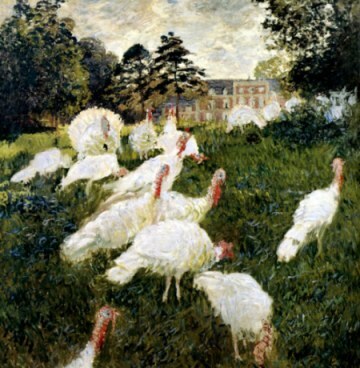 French impressionist Claude Monet painted this group of foraging turkeys on the lawn of his patron, Ernest Hoschede's, estate in Montgeron where Monet and his family temporarily lived for a while. The subject was considered perhaps rather unusual and the introduction of animals was rare in Monet's work. The painting is housed at the Musee d'Orsay in Paris. Turkey have a large vocabulary. Yes that's right! Wild Turkeys have been found to have twenty distinct and specific vocalisations. "They recognise one another by their voices as well as their head characteristics" To turkeys the voices of other turkeys are unique and recognisable"
Turkeys are more intelligent that you think. Tom Savage is a poultry scientist and animal science professor at Oregon State University and a nationally known researcher. Below is an extraction from an article By Aaron Hougham, Barometer Staff writer explaining research conducted by Tom savage and his colleagues into the behaviour of turkeys. "He said that one popular misconception is that turkeys are so stupid they will stare at rain until they drown. He and his colleagues searched for an answer to this phenomenon. In the early 1990s they discovered a genetic condition called tetanic torticollar spasms.This condition causes some birds to act abnormally, sometimes cocking their heads and starting at the sky for 30 seconds or more. "It's an example of how a misunderstood animal behavior becomes identified as proof that the animal is extremely lacking in intelligence," Savage said in a recent press release.Providing another example of their intelligence, Savage had an illustration most college students could relate to. "If you throw an apple to a group of turkeys, they'll play with it together," he said. "Kind of like football. "Savage asks, "If turkeys are so dumb, then why do they socializelike that?" "If I had to sum up my experience with the wild turkey, the most profound thing that I discovered is that they are much more complex in their intelligence, their behavior and their problem- solving ability than I ever imagined. They are sentient beings. By every measure and every definition of intelligence, in their environment and in their world they are without questions much more intelligent than I was. " "This scholarly and authoritative book examines the cultural and literal history, as well as the natural history and biological needs and concerns of turkeys. And much more!"